I was not raised in an authoritative parenting environment. As I have mentioned my mom was a single parent, and she didn’t have much help. As a teenager I was grounded fairly often. Usually because I was unmotivated or behaving impulsively or just ignoring my parents completely. Grounding worked as a punishment for me because I was not the type of kid to sneak out or really fight back. That moment between my grandmother and I really stuck with me. I still didn’t understand that ADHD was the reason I was getting in trouble, but I did feel validated in my experience that punishments don’t work. 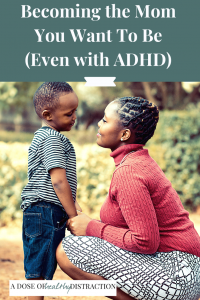 In the midst of my own parenting journey I still wonder: How can I become the mom I want to be – even with ADHD? According to Michael Dyson, the words “discipline” and “punishment” are actually vastly different, though many of us get them confused. Dyson explains that there are socio-economic and even ethnic connections to how we parent our children. See his article HERE. Discipline comes from the Latin word discipuli meaning student or disciple. This suggests a teacher – pupil relationship. Punishment on the other hand comes from the Greek word poine a Latin derivative of poena, which means revenge, and forms the words pain and penalty. In my unending quest to become a better parent, I have read the original Parenting with Love and Logic by Foster Cline and Jim Fay. To this day, it is my #1 go –to for my parenting questions. This is the one that I have. click here for my full disclosure policy. Even though I do not always practice what Cline and Fay teach, I use this book to bring me around when I am having a bad parenting moment. Or week, as the case may be. There are Love and Logic books available on a variety of parenting topics, I highly recommend you check them out. Authoritative Parenting is finally getting some street cred. There are basically four styles of parenting: Authoritarian, Authoritative, Permissive and Neglectful. Permissive and neglectful speak for themselves. These are the parents who are so overwhelmed by their own problems, or so checked-out that they barely acknowledge their children. Here is a link to the basics of Baumrind’s research. what is an Authoritarian parent? Authoritarians, “believe that children are strong-willed and self-indulgent.” These parents value obedience. People who talk about “whooping” children and how it cures ADHD – these are the authoritarian types. What is an authoritative Parent? What stood out to me was the research showing that children of Authoritarian parents didn’t do so well later in life. These children were more prone to depression, anxiety and low self-esteem. As were the children of absent or neglectful parents. On the other hand, children raised by Authoritative parents were the most psychologically well adjusted. When parents are loving and responsive, their children naturally want to be aligned with them. I desperately want to be an authoritative parent, but I worry that my ADHD issues will conflict with my desire to be the kind of parent I want to be. So how do we become the moms we want to be? I am setting limits for my child so that he can grow into himself. If I don’t limit his television time he will watch it nonstop. If I don’t show him that the world is bigger than that tiny screen, how will he learn? I also have a limit on how much screaming and verbal abuse I will tolerate. My son knows that if he is being unkind he will have to go to his room and work it out. He also knows that if he needs my help talking it out I am all ears. Here’s to hoping he will start to set his own limits as he matures. There is nothing harder than saying “no” when my son is staring at me with his big, watery blue eyes. And that lip….gets me every time. But no, we cannot read yet another book. No, we cannot camp out in the backyard tonight. No, we cannot buy that Nintendo Switch game right now. Remember when I reviewed The Explosive Child? One of the main skills I took from that book was reflective listening. For us, this involves me restating what my son says to me. Then I ask for clarification and invite him to come up with a solution. If that doesn’t work, I stay quiet and let him think. Listening is such an important skill. Everyone wants to feel heard, understood and accepted. As an authoritative parent I am mindful of the fact that my child is always watching. He is absorbing my way of relating to other people and my coping mechanisms. Or lack thereof. If I want him to be a kind human being, then I have to reflect that. I cannot make disparaging remarks about politicians or people in our family no matter how much I want to. I have to be a role model of acceptance and caring. I am modeling self-care as well. I do this by placing a high value on my physical and emotional health. Since I have ADHD myself, it is often hard for me to plan ahead and be consistent with my parenting. I acknowledge my faults to my son all the time. Updated***** I started taking Concerta and it has made all of the above easier for me to manage. In order to be the kind of parent I want to be, I have to treat my ADHD. Manage your ADHD and your emotions, and all the other stuff of life gets easier! Join my private membership community! April is FREE.